Say hello to Wally, the largest mammal on earth. I had the good fortune of growing up in Massachusetts spending countless hours in, on and around the ocean and still get back to Cape Cod regularly. The ocean has been a significant contributor to the themes of my art. 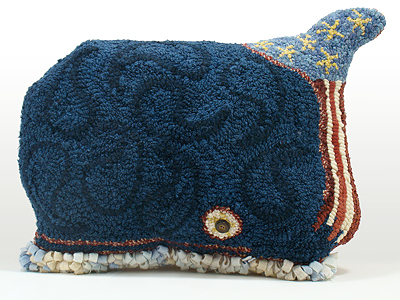 Wally joins other ocean creatures, lighthouses, sailing ships and harbor scenes that I have done over the years. Wally is 100% wool fabric hooked on linen and the pillow is backed with cotton fabric.